I was in the middle of reading two books on my Kindle, Doctor Thorne by Anthony Trollope and SPQR: a History of Ancient Rome by Mary Beard, when the battery died and I know I could still have continued reading whilst it was re-charging, but I didn’t. 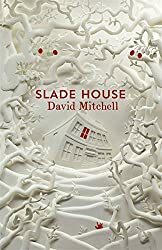 Instead I picked up Slade House by David Mitchell, a book I’d been thinking of reading soon and once I started it I didn’t want to stop. It’s not long, just 233 pages and they just whizzed past my eyes in no time. Apparently it began as a short story on Twitter – but I didn’t know that – and is a sort of sequel to The Bone Clocks – but I haven’t read that, and there is a character near the end who also appears in The Thousand Autumns of Jacob de Zoet – but I haven’t read that yet either! None of that mattered. I suppose it’s the sort of book to read at Hallowe’en, but that doesn’t matter either, because I read it, devoured it I could say, yesterday and was thoroughly entertained. It’s a mixture of a ghost story, science fiction and horror. Something nasty happens every nine years at the end of October at Slade House. I read it as a fantasy, something that I couldn’t believe could ever happen (or at least, I hope not) – but that didn’t stop me enjoying it immensely. It’s not easy to find Slade House. It’s down Slade Alley, which doesn’t normally exist and it only appears to those who have been invited, or are drawn to it. There is a door set into the right hand wall of the alley, a small black iron door with no handle or keyhole, that opens if you’re meant to enter. There you meet a stranger, are invited into the House, and find yourself in a strange and dangerous situation, and there is no way out – eventually you find yourself in a long attic at the top of the stairs – where something terrible happens to you. The stories begin in 1979 (although in fact it begins much earlier than that) and ends in a strange and mystifying way in 2015. Each story is complete in itself; the people who enter Slade House do not seem to be connected in anyway – a young teenage boy and his mother, a recently divorced Detective Inspector, students on a Paranormal Society field trip, and then the sister of one of the students. The connection is the House and the brother and sister who occupy it – and to say what they were would be to reveal too much. Needless to say that I was hoping each time that the victims would escape their fate. I was gripped both by the individual stories and by Slade House itself, enchanting and darkly sinister. The sense of menace just grew as each victim succumbed and yet tried to warn those who followed. Now, I’m keen to read both The Thousand Autumns of Jacob de Zoet, which I bought a few years ago and is still sitting in my TBR piles and The Bone Clocks, which I haven’t got yet. It just shows how reading one book can seriously disrupt whatever reading plans I had!